Offering you a complete choice of products which include coloured colander, conical colanders, quality colanders, deep colanders, certified colanders and steel colanders. 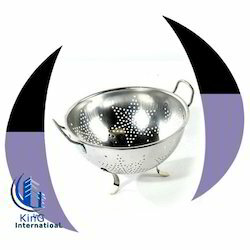 We are known to offer the Steel Colander to our customers. We are offering Steel Colanders to our clients. 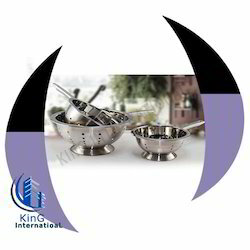 These colanders can be availed in diverse designs, sizes and shapes as per the requirements of our clients. 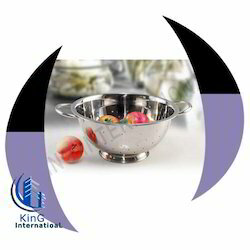 We are involved in offering a wide range of Stainless Steel Colanders Bowl to our most valued clients. Our range of Linear Colander is widely appreciated by our clients which are situated all round the nation. All the colanders can be available two side handle, two side clip or single handle and single clip. It can be done heavy or light as per requirements. 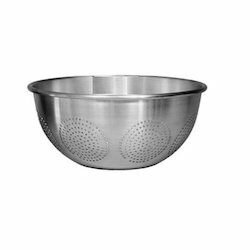 These Handle Steel Colander are generally used for colanders and sauce pans. Our range of handles are known for thick and hollow, which helps in easy gripping. The Handle Colander are used for draining and straining and also light in weight. We are offering a wide range of Lightweight Colanders to our valuable client in different specification to meet the diverse requirement of clients. 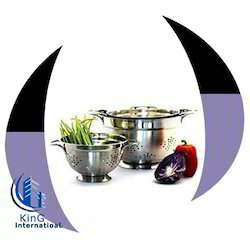 We offer our client an excellent quality range of Mango Colander. These Mango Colander are offered in variety of designs, shapes, sizes and colors.